List of Contributors Jeffrey C. Alexander is professor of sociology at Yale University. He is a sociologist of major international stature. Since his multivolume Theoretical Logic of Sociology (1982-83), he has published numerous books and articles, most recently edited, with Steven Seidman, The New Social Theory: Contemporary Debates (2001). In recent years he has concentrated on the problems of culture and civil society and he is currently preparing for publication a book entitled Possibilities of Justice: Civil Society and Its Contradictions. Henry E. Allison is currently professor of philosophy at Boston University and professor emeritus at the University of California, San Diego. His major books include Kant&'s Transcendental Idealism (1983) and Kant&'s Theory of Freedom (1990), Idealism and Freedom (1996), and Kant&'s Theory of Taste (2001). Carol L. Bernstein is Mary E. Garrett Alumnae Professor of English and Comparative Literature at Bryn Mawr College. Her books include Precarious Enchantment: A Reading of George Meredith and The Celebration of Scandal: Toward the Sublime in Victorian Urban Fiction. She is currently working on cultural memory and the ethics of narrative, as well as Walter Benjamin and the trajectory of the sublime. Richard J. Bernstein is Vera List Professor of Philosophy and Chair at the Graduate Faculty of the New School University. His recent books include Beyond Objectivism and Relativism: The New Constellation, Hannah Arendt and the Jewish Question and Freud and the Legacy of Moses. He is currently working on the problem of evil. Isabel Cabrera is professor of philosophy at the Institute for Philosophical Research, Universidad Nacional Autónoma de México. She is the author of El Lado oscuro de Dios (1998), and editor of Voices in Silence: Job, Text and Commentaries (1992), and of Religion and Suffering (1996). Maeve Cooke is a senior lecturer in the Department of German at University College Dublin, Ireland. She is author of Language and Reason: A Study of Habermas&' Pragmatics (985) and editor of a collection of Habermas&'s writings on language and communication: On the Pragmatics of Communication (1998). She has published a number of articles in the areas of political and social philosophy. Her current research projects include books on self-realization and on evil. Manuel Cruz is professor of philosophy at the University of Barcelona. His most recent books are: Filosofía de la historia (1991), A quién pertenece lo ocurrido? (1995), and Hacerse cargo (1998). He has edited the books: Individuo, Modernidad e Historia (1992), Tiempo de subjetividad (1995), and Tolerancia o Barbarie (1998). He is editor of the philosophy series "Pensamiento Contemporáneo" and "Biblioteca del Presente" and co-director of the series "Filosofía hoy y Biblioteca Iberoamericana del Presente." Peter Dews is professor of philosophy at the University of Essex. He has held visiting positions at the University of Konstanz, and at the Graduate Faculty, New School for Social Research. He is the author of Logics of Disintegration (1987), and The Limits of Disenchantment: Essay in Contemporary European Philosophy (1995). He has also edited Autonomy and Solidarity: Interview with Jürgen Habermas (1986), and Habermas: A Critical Reader (1999). His current research concerns the relation between religious and philosophical discourse in modernity. Alessandro Ferrara is associate professor in the Faculty of Letters and Philosophy at the University of Parma. He is the author of Modernity and Authenticity: A Study of the Social and Ethical Thought of Jean-Jacques Rousseau (1993), Reflective Authenticity: Rethinking the Project of Modernity (1998), and Justice and Judgement (1999). He is currently working on problems of authenticity and evil. Robert Fine is director of the Social Centre at the University of Warwick. He is the author of Democracy and the Rule of Law: Liberal and Marxist Critiques (1985), Beyond Apartheid: Labour and Nationalism in South Africa (1991), coeditor of People, Nation, and State: The Meaning of Ethnicity and Nationalism (1999), and of Social Theory after the Holocaust (2000). A version of this paper has been published in Social Theory after the Holocaust, ed. Fine and Turner (2000). His latest book is Political Investigations: Hegel, Marx, Arendt (2001). Gustavo Leyva is professor of philosophy at the Universidad Autónoma Metropolitana, México. He is director of the postgraduate studies of political philosophy at Universidad Autónoma Metropolitana, Iztapalapa. He has worked on the philosophy of Kant and published several articles in this field. Susan Neiman is Director of the Einstein Forum, Postdam. She has also been professor of philosophy at Yale University and Tel Aviv University, and is the author of Slow Fire: Jewish Notes from Berlin (1992), The Unity of Reason: Rereading Kant (1994), as well as numerous essays. Her next book is Evil in Modern Thought (2001, forthcoming). María Pía Lara is professor of philosophy at the Universidad Autónoma Metropolitana, México. She has published La democracia como proyecto de Identidad Etica (1992), Moral Textures: Feminist Narratives on the Public Sphere (1998). Her current research is on the problem of evil and on the normative foundations of democracy and globalization. Carlos Pereda is professor of philosophy at the Institute for Philosophical Research , Universidad Nacional Autónoma de México. He has published Debates (1987), Conversar es Humano (1991), Vértigos Argumentales (1993), Razón e Incertidumbre (1994), Sueños de vagabundos: Un Ensayo sobre filosofía, moral y literatura (1998), and Crítica de la Razón Arrogante (1998). Sergio Pérez is professor of philosophy at the Universidad Autónoma Metropolitana. He has been dean of humanities and social sciences at Universidad Autónoma Metropolitana, Iztapalapa (1992-96), and head of the Department of Philosophy at UAM-I (1985-89). He has published numerous books and articles on Hegel and Foucault. His most recent book is Sobre el Mentir (1998). This innovative volume will be welcomed by moral and political philosophers, social scientists, and anyone who reflects seriously on the twentieth century's heavy burden of war, genocide, ethnic cleansing, and other evidence of people's desire to harm one another. María Pía Lara brings together a provocative set of essays that reexamine evil in the context of a "postmetaphysical" world, a world that no longer equates natural and human evil and no longer believes in an omnipotent God. The question of how and why God permits evil events to occur is replaced by the question of how and why humans perform radically evil acts. 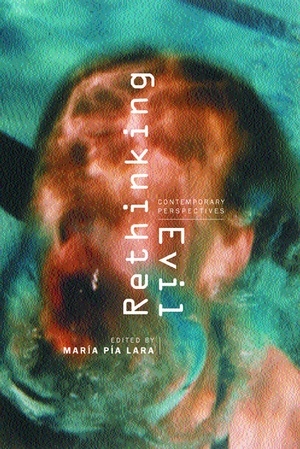 María Pía Lara is Professor of Philosophy at the Universidad Autónoma Metropolitana in Iztapalapa, Mexico.